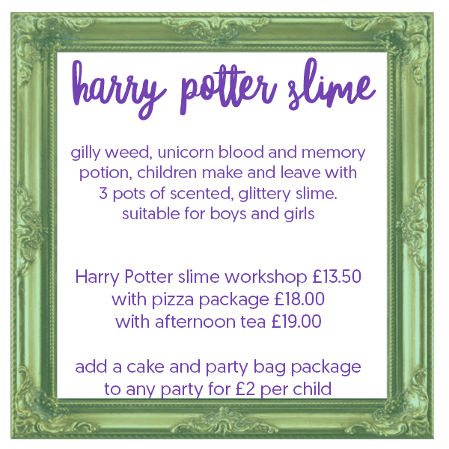 Slime parties are by far our most popular parties! 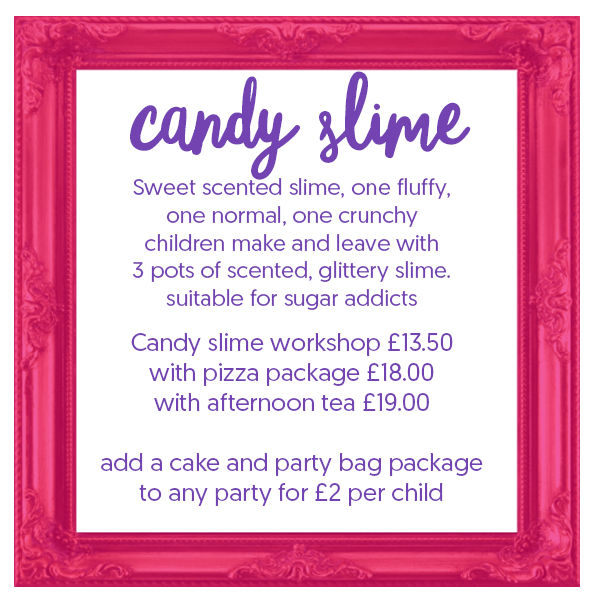 Workshop only Parties - a 90 minute slime workshop, sadly we do not allow food or drink in our workshop. 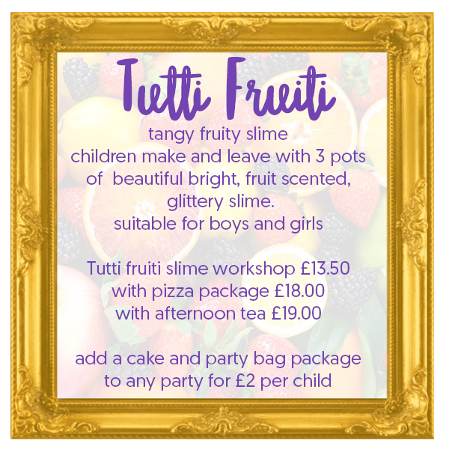 Workshop and pizza Party - upon booking you will be asked to choose a theme for your slime workshop, the birthday child is the star of their party, they choose colours, glitters, scents and much more, followed by 45 minutes to eat Pizza in our restaurant (Volpe) next door but one, the party comes with bottom less squash. Workshop and afternoon tea Party - a 90 minute workshop followed by 60 minutes sandwiches cake and other treats complete with squash in our restaurant (Volpe) next door but one, Sadly our restaurant cannot cater for children with nut allergies, if this should arise with your guests we are happy for the parent of the child to pack food for them. 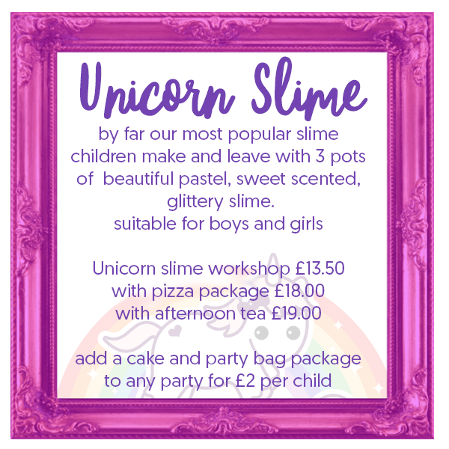 click the "I WANT A PARTY" button fill in the form with times and dates and we will get back to you to confirm your dates, a 50% non refundable deposit will be taken for all parties upon confirming dates with the balance payable 10 days before your party. 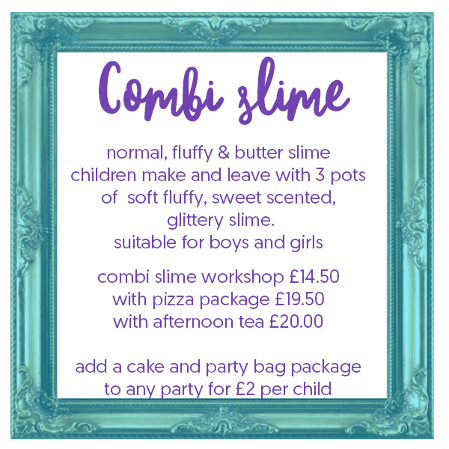 simple slime parties, designed for age 5 or under,children make one slime and then eat, the party lasts for 90 minutes, 45 minutes slime making, 45 minutes eating time, minimum booking is 12 children. 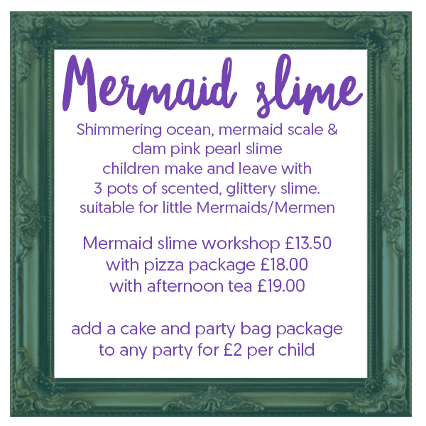 Party dates are filling up fast please don't leave booking until the last minute. 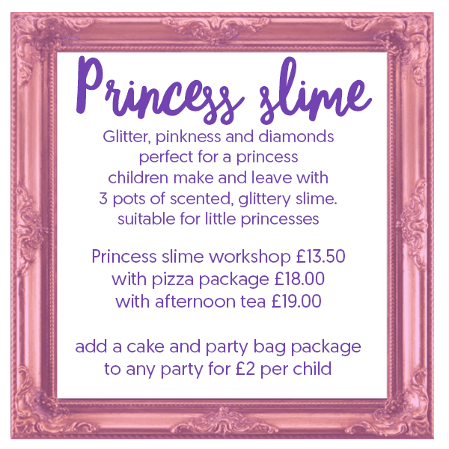 We can provide cakes, party bags and anything else you need please see our add on items page, our party bags start at £1.50 per child and our cakes start at £10. once you have sent us your details and We have confirmed your party date is available we will arrange for the deposit of 50% to be taken Via our website, it is important not to invite guests until you have paid your deposit to avoid confusion please remember that your party is not confirmed until the deposit has been paid. 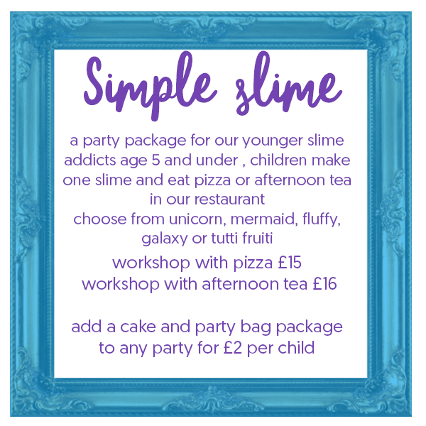 We know little ones love slime too, but we also know that our 3 slime parties can be a little tough for them, Simple slime is designed for ages 5 and under, children make one themed slime and then eat, all parties come with bottomless squash. 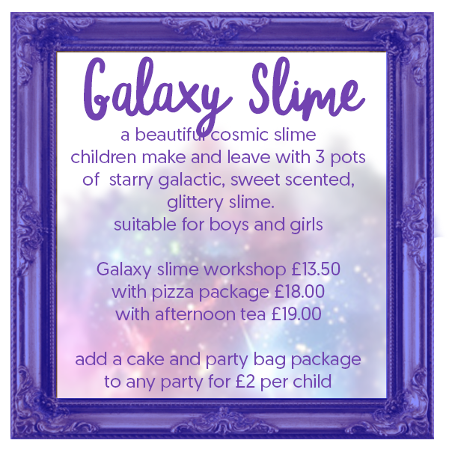 simple slime parties last for 90 minutes, 45 minutes slime making, 45 minutes eating time, minimum booking is 12 children. Party is for age 5 and under only, although we understand some guests may be 6.